The underwater video camera and quadrat-frame used by NBNERR to map eelgrass as part of the Tier-2 Rapid Assessment. Photo courtesy of Kenny Raposa, NBNERR Research Coordinator. 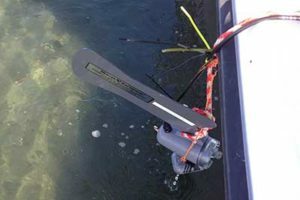 In Rhode Island, a three-tiered monitoring effort is used to comprehensively assess the geographic extent, cover, and condition of eelgrass beds. Tier 1: landscape scale, GIS (Geographic Information System) based assessment using aerial photography and remote sensing to map eelgrass distribution throughout state coastal waters. Tier 2: field-based, rapid assessment monitoring, which divides eelgrass beds into gridded cells and then collects specific data in each cell, including percent cover, canopy height, shoot length, number of leaves per shoot, and water depth. Eighty stations around Prudence Island were monitored by the Narragansett Bay National Estuarine Research Reserve using underwater video. 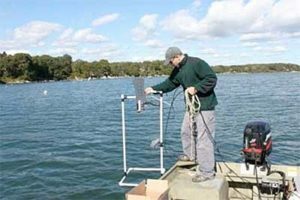 Tier 3: intensive, detailed monitoring in which eelgrass biomass and other eelgrass bed properties are measured over multiple time scales for specific areas. Two sites—Fort Getty, Jamestown, and T-wharf, Prudence Island—are monitored by Save The Bay. Save The Bay conducting eelgrass plantings. Photo courtesy of Save The Bay. In addition to conducting Tier III monitoring at two sites, Save The Bay (STB) has also expended significant efforts in the past to restore eelgrass. 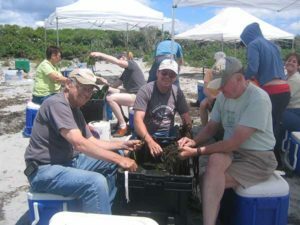 For many years, STB actively conducted eelgrass restoration in which individual eelgrass shoots were removed from “donor” sites and transplanted by hand to restoration sites. This was a time- and labor-intensive project, including both in-depth analysis to identify donor and restoration sites, and significant numbers of volunteers to perform the work; however, beyond the first year after planting, these restoration projects were largely unsuccessful. Monitoring helped managers realize that current strategies were not having the intended impact, allowing STB to move resources to alternative methods. One current area of focus is improving water quality in the bay, as periods with poor water quality were associated with the worst performance among the eelgrass transplants. Water quality improvement from recent and planned infrastructure improvements, such as wastewater treatment plant upgrades and storm sewer structures, may make eelgrass transplantation an effective restoration strategy in the future. Additionally, ongoing eelgrass restoration in other locations, such as Boston Harbor, Long Island, and Virginia may provide “lessons learned” to improve eelgrass restoration success in Narragansett Bay.